A popular saying, right. But it boils down to the fact you can use the Web in three distinct ways. Either you search for something, or you directly access websites you know and like, or, finally, you use a program that can display all that fine remote content on your computer without wandering around. That’s what RSS is all about. Enter Liferea. True, I’m cheating. Pulling RSS feeds and web pages from the Internet is no different than using a browser, but if a program does that in an integral way, allowing you to preview content but also enjoy the full plethora of text, images, audio, and video for a given subset of domains, then it is doing something else. It’s bringing you the closely guarded corner of the Web you consider yours. 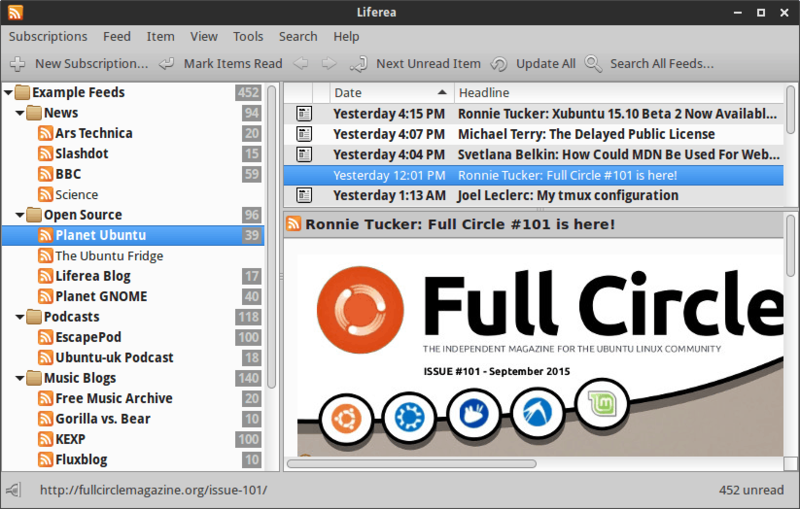 One of the programs that promises this functionality is Liferea, a news aggregator for Linux. 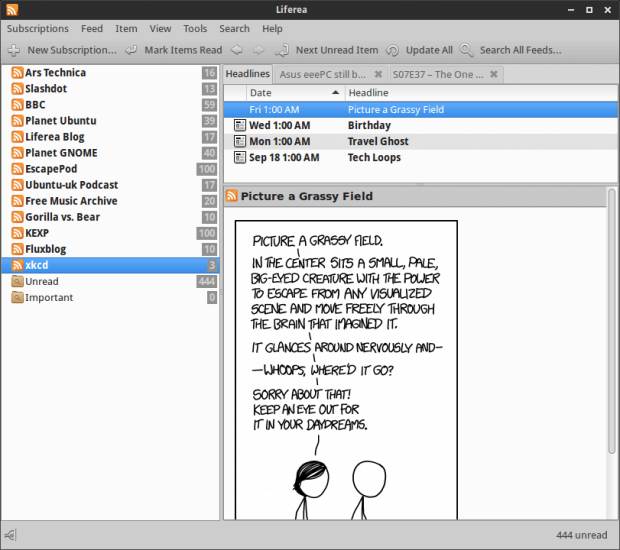 Liferea, how do you pronounce it? As I was testing the software, I wondered what the correct way of saying the program name is. Life-rea? Lay-fearea? Anyhow, this lightweight, elegant little tool is designed to be your ultimate RSS reader. It comes with a tabbed internal browser interface, which lets you enjoy feed articles, decent security and privacy, plugins, and most importantly, it supports all the scripting and media you can expect to find on a typical Web page. I have mentioned and praised the utility in my non-KDE non-Gnome guide to Linux apps, but now we need to explore in further detail. The installation is trivial, as the software is available in pretty much every major distro repo. 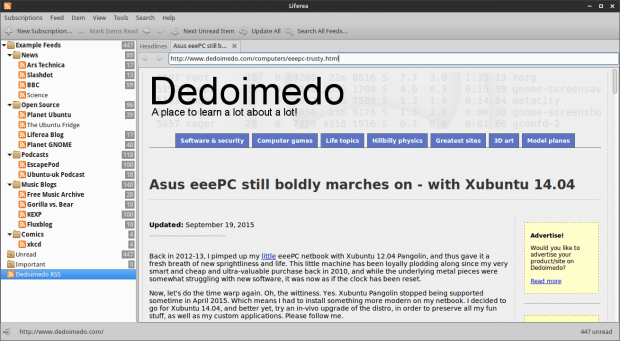 When you launch it the first time, the program will update its default set of about two dozen feeds, including the likes of Arstechnica, Slashdot, BBC, Planet GNOME, xkcd, and several others. Adding new feeds is a breeze, including an auto-discovery feature. You can also quite easily search for keywords, so if you have tons of feeds, you won’t get lost. You can preview the items, and if you double-click, they will open in a separate tab. Like any real browser. This worked well, to some extent. With the sidebar taking roughly 20% of the screen equity, some websites may overflow horizontally, making them tricky to read. Moreover, I struggled with embedded Youtube videos, as the service deliberately disables remote play for embedded code in order to lure you back to their site. Watching from afar, you are not exposed to any advertisement, you cannot be influenced, and this is entirely the company’s loss. But it makes a seamless Liferea experience slightly more difficult. Horizontally stretched content can be tricky. Vertical content works better in Liferea. Can’t play embedded video, the seamless experience is tarnished. I don’t have any privacy options in my version; not nice. And confusing. The program comes with a healthy preferences menu, where you can tweak lots of options, including the aforementioned security. I also found the plugins systems to be interesting. However, at the moment, there does not seem to be any way to add new plugins and enhance the basic functionality. Maybe this is a test feature and a placeholder for making Liferea even more extensible and useful in the future? Not a bad concept, but I’m wondering what else a news reader could do. Pull tweets? Social network updates? Something else entirely? Liferea also supports plugins. To what end, we don’t know yet. 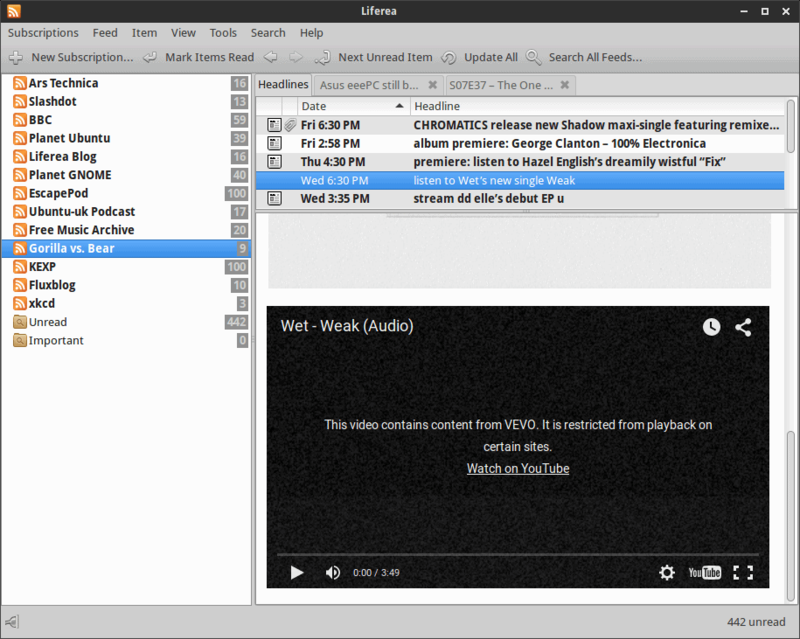 Liferea is a neat program. It works well, it’s stable, fast enough, and it does not stutter or crash even when running numerous tabs and loading info from dozens of feeds. I can’t say how it behaves when you into thousands, though. The interface is simple enough. The ability to play rich media is also very useful, but there are some limitations. Which is why it works well, most of the time. 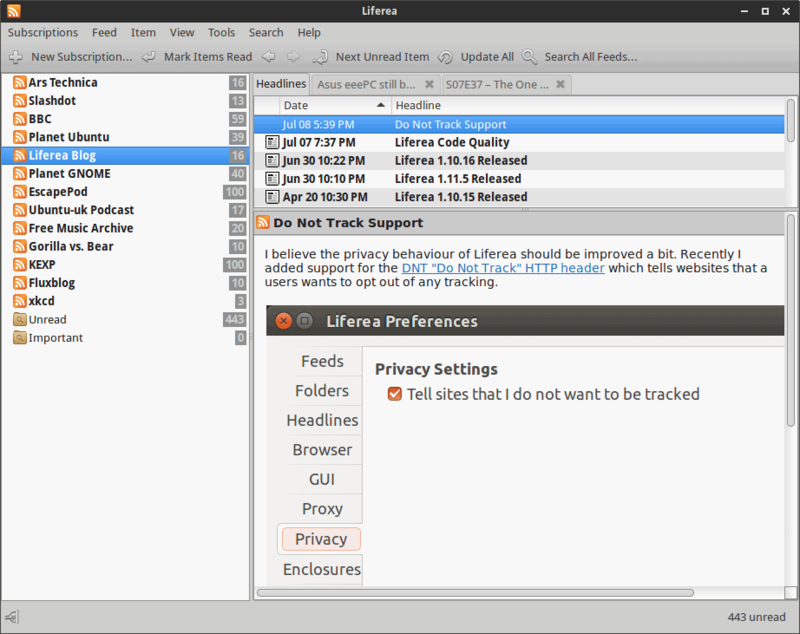 And so we come to the end of the third way of using the Web – with Liferea. Not bad, as it gives you the peace of mind and quiet in the largely info-overloaded, overcrowded, distraction-saturated Internet. Many programs offer the same functionality, but somehow, Liferea does it almost effortlessly, and that’s the magic with any successful software. 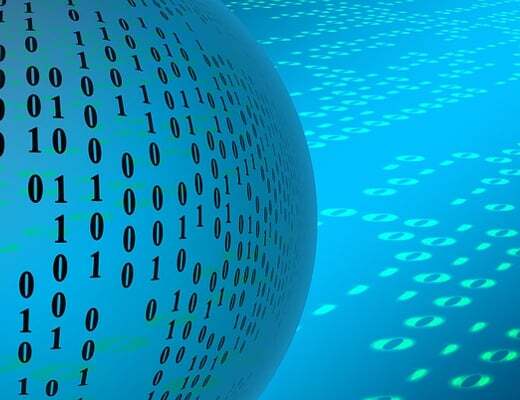 If you like to collate all your data into a single channel and sample it on your own, away from the public humdrum, you might want to take Liferea for a spin. It could give you a fresh breath of Internet. Take care. I have close to 200 feeds in Liferea. It does tend to become unresponsive during feed updates. An overlooked advantage of a traditional feedreader like Liferea is that it displays the content provided in the feed without any of the clutter found at the site. Some sites push the full content of articles to their feed, many do no, though, seeing the feed as a mechanism to generate traffic. liferea is a joke of rss readers.. I have 340+ and rssowl is undisputed king (though its built in java ) and using from past 4 years.. i recently switched to greader pro from rssowl and its a great responsive and stable reader for android.. desktop rss reader gradually come to end.. im really shocked to see a review for a non standard and poor software like liferea from a world renowned author.. The fact you do not like an application does not mean it’s bad or useless. Saying something is a king is subjective, Android is not relevant here, claiming desktop RSS coming to an end is a speculation without any hard facts. Thank you for the compliment, though. oh..im not a tech expert… but i have used most of the rss clients and my long time searching of past 5 years for reliable one come to end with rssowl@linux and feeddemon@win.. if u have only <100 sources everything is good.. thats what i have tried to express…. Also, most of the today's smartphones have good hardware spec. and easily handle such bulk app for regular usage.. am using greader pro in asus zenfone and it easily handles 6GB of offline data from 300+ sources without any stagnation.. 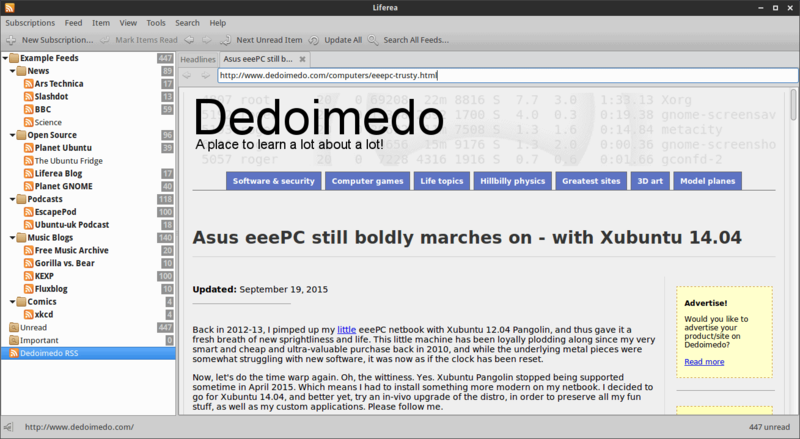 I love RSS and have Liferea on a Intel Core2 Duo CPU E4500 @ 2.20GHz with 4 GB RAM running Debian GNU/Linux 8.2. I’m behind in my reading with 32,352 unread items. It is a bit slow on my machine. But, very good. After Opera/Presto’s death I tried Liferea, but for now I settled on QuiteRSS. Another RSSOwl user here. I tired Liferea sometime ago, didn’t like it then, sure I won’t like it now. RSSOwl has no problems with embedded videos. I have not found anything that compares.